Import the images you wish to use by selecting File > Import > Import to Stage. 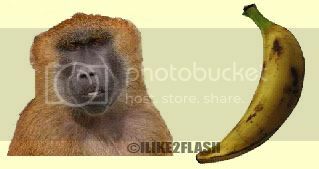 I have used an image of a monkey and a banana, but you can use whatever images you wish. Convert both of your images into movie clips (F8) and give them the following instance names accordingly: monkey_mc and banana_mc. Select Window > Components and drag two checkbox components onto the stage and place them below the images. Then give them the instance names: cb1 and cb2. //Gives labels to the checkboxes. //Sets the initial transparency values of the movieclips. //Event listener for the checkboxes. //Shows and hides the images. Test your checkbox component Ctrl + Enter. Now trying selecting the checkboxes and you should notice the images fading in and out. You should now be able to use the checkbox component in Actionscript 3.0. I was just wondering if instead of using images from within the FLA, you could use external .swf's? I haven't really tried using external swf files, so i'm not really sure if it would work. I suppose you can try. I'm not really sure what you mean. I think the scenarios you listed are skin properties for the checkbox. Take a look the AS3 checkbox component reference. And I was also trying to figured how selected_disabled a checkbox button through actionscript? I have 6 checkboxes and want to disable 3 unchecked buttons when 3 are selected. I can do this with if statements but id have to write about 30 if statements. Is there a quick way to disable checkboxes when 3 of 6 are checked. So for instance if I clicked boxes 1,2,3 then 4,5,6 would be disabled. The if statement you wrote in your previous comment will work just fine. Great code, I know just how to use it in a current project. Thanks!